The new Start screen in Windows 8 whisks you away from traditional Windows desktop and drops you into a foreign land with no helpful translator at your side. That’s right: Windows 8 no longer has a Start button or a Start menu. 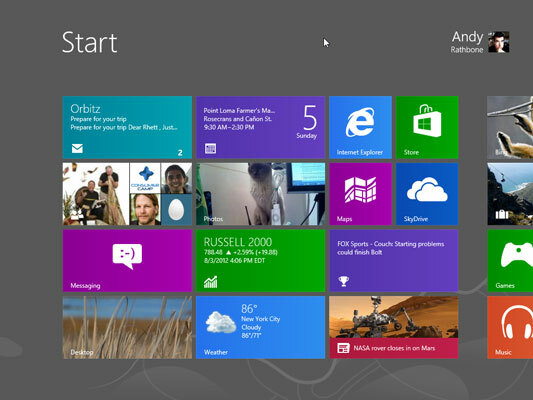 Instead, the new Windows 8 Start screen appears whenever you turn on your computer. Whereas older Windows versions had a small Start menu on a desktop, the Windows 8 Start screen fills the entire screen with large tiles stretching beyond the right edge. Each tile represents a program installed on your computer. As you work, you’ll constantly switch between the screen-filling Start screen and the traditional screen-filling desktop. Despite the drastic remodel, the Start screen still offers a way to start programs; adjust Windows settings; find help for sticky situations; or, thankfully, shut down Windows and get away from the computer for a while. Some Start screen tiles needn’t be opened to see their contents. For example, the Calendar tile constantly updates to show the current date and day, as well as your next few appointments. The Mail tile cycles through the first words of your latest e-mails. Your Start screen will change as you add more programs and apps to your computer. That’s why the Start screen on your friend’s computer, as well as in this book, is probably arranged differently than your computer’s Start screen. See the Start screen’s tile named Desktop? Click that one to fetch the familiar Windows desktop. Whew! If you prefer to avoid the Start screen and stay on the traditional Windows desktop as much as possible. Does your mouse have a little wheel embedded in its back? Spin the wheel, and the Start screen moves to the left or right, accordingly. It’s a handy way to move quickly across the entire Start screen, from left to right. As you move your mouse pointer, the Start screen follows along. When the pointer reaches the screen’s right edge, for example, the Start screen brings the off-screen portions into view. See the little bar along the Start screen’s bottom edge? That’s a scroll bar. Drag the scroll bar’s light-colored portion to the left or right: As you move that portion, the Start screen moves along with it, letting you see items living off the screen’s right edge. On a touchscreen, navigate the Start screen with your finger: Pretend the Start screen is a piece of paper lying on a table. As you move your finger, the Start screen moves along with it. On a keyboard, press the right- or left-arrow keys, and the Start screen’s tiles move accordingly. Press the keyboard’s End key to move to the end of the Start screen; the Home key moves you back to the Start screen’s front. Windows 8 contains hidden doorways tucked away in its corners, as well as secret passages enabled by pressing certain key combinations. The following table reveals unlabeled ways to fetch the Start screen and switch among your apps, whether you’re using a mouse, keyboard, or touchscreen. screen icon appears, click the mouse. Touchscreen Press the Windows key below your tablet’s screen. appear, click the one you want to see full screen. then back. Then tap the thumbnail of your desired app.